Don’t miss the holiday that comes once in 100 years. Come to Hastings and share the Centennial excitement that goes on non-stop throughout 1984. Join us this holiday weekend for the colourful official celebrations. Displays, parades, sporting tournaments, historical re-enactments – fun and activities for everyone. Hastings is a great holiday place any year but 1984 is special. So plan your Centennial holiday now. Otherwise you’ll have to wait another 100 years. Holmes Miller, of Napier traces the origins of Hastings through the life of Thomas Tanner, the first white man to live on the Heretaunga plain. IT IS necessary to go back at least 135 years to get the origin of Hastings into perspective. The city emerged from the waterlogged wastes of the Heretaunga plain, an estuary from one of the three rivers fed by one of the largest catchment areas in the country. The trail blazer was Thomas Tanner a young Englishman who should be gratefully remembered in Hawke’s Bay. He knew what it was like to lie in bed and listen to the early morning croaking of the frogs on the Heretaunga plain. His was a mean dwelling, no more than a shack. There were no neighbours, for his was the first European-occupied habitation on the plain. The isolation palled, he hated it. The site is occupied today by Royston Private Hospital. He was a young man of considerable wealth, destined to dissipate two fortunes and win and thrive on a third. He was to have four homes in Hawke’s Bay, one of them of a grandeur that has never been emulated. Tanner was no farmer, but he had imagination. The evil smelling swamp, toitoi, cutty grass and stunted scrub depressed him but he had the means at his disposal to do something about it and managed to obtain the leasehold of 17,785 acres at an annual rental of 1200 pounds. He recognised that it was expedient for private ownership of the land to be encouraged. One of his ideas was to let the tillage to contractors, giving them one acre in every three to be ploughed. Tanner did not set foot in Hawke’s Bay until 1853. He had spent some years in the Wanganui district, learning what he could about farming and meeting the challenges of colonial life, and he foresaw the farming potential of the Heretaunga plain which its Maori owners did not. In 1857 the Ngaruroro River cut a swathe through the swamp in a direct line out to sea from Fernhill, instead of meandering its way, as before, towards Havelock North hills, providing the drainage that the soured land needed. Tanner’s first major land purchase in Hawke’s Bay was “The Brow” property on the outskirts of the 70-mile bush at Hampden, or Tikokino, as it is called today. Within a few years he was back in England, and in a few more back in Hawke’s Bay again. This time he had chartered a ship. Aboard he had a wife, some of his brothers and sisters, a cow in milk, copious quantities of farm implements and household effects, (including a gold-plate dinner service and a rocking chair relished by his newly-wed wife, Julie [Julia]). 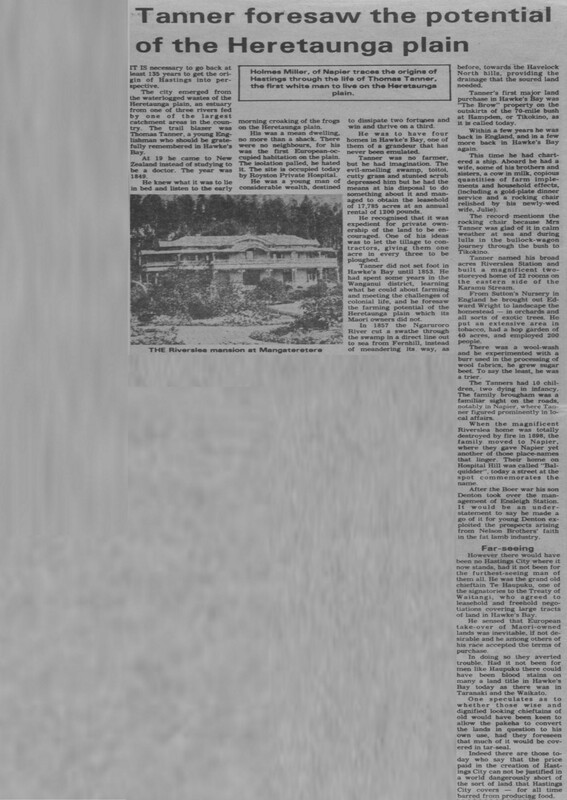 The record mentions the rocking chair because Mrs Tanner was glad of it in calm weather at sea and during lulls in the bullock-wagon journey through the bush to Tikokino. Tanner named his broad acres Riverslea Station and built a magnificent two-storeyed home of 22 rooms on the eastern side of the Karamu Stream. From Sutton’s nursery in England he brought out Edward Wright to landscape the homestead – in orchards and all sorts of exotic trees. He put an extensive area in tobacco, had a hop garden of 40 acres, and employed 200 people. There was a wool-wash and he experimented with a burr used in the processing of wool fabrics, he grew sugar beet. To say the least, he was a trier. The Tanners has 10 children, two dying in infancy. The family brougham was a familiar sight on the roads notably in Napier, where Tanner figured prominently in local affairs. When the magnificent Riverslea home was totally destroyed by fire in 1898, the family moved to Napier, where they gave Napier yet another of those place-names to linger. Their home on Hospital Hill was called “Balquidder [Balquhidder]”, today a street at the spot commemorates the name. After the Boer war his son Denton took over the management of Ensleigh [Endsleigh] station. It would be an under-statement to say he made a go of it for young Denton exploited the prospects arising from Nelson Brothers’ faith in the fat lamb industry. However there would have been no Hastings city where it now stands, had it not been for the furthest-seeing man of them all. He was the grand old chieftain Te Haupuku [Hapuku], one of the signatories to the Treaty of Waitangi, who agreed to leasehold and freehold negotiations covering large tracts of land in Hawke’s Bay. He sensed that European take-over of Maori-owned lands was inevitable, if not desirable and he among others of his race accepted terms of purchase. In doing so they averted trouble. Had it not been for men like Haupuku there could have been blood stains on many a land title in Hawke’s Bay today as there was in Taranaki and the Waikato. One speculates as to whether those wise and dignified looking chieftains of old would have been keen to allow the pakeha to convert the lands in question to his own use, had they foreseen that much of it would be covered in tar-seal. Indeed there are those today who say that the price paid in the creation of Hastings City can not be justified in a world dangerously short of the sort of land that Hastings covers – for all time barred from producing food. 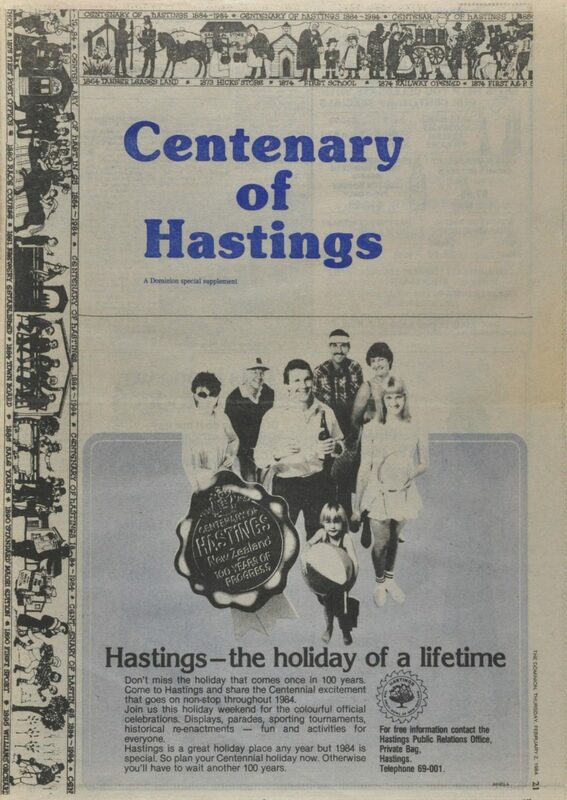 TOMORROW Hastings celebrates its centenary. On February 3, 1884 a town board was formed to manage the new town district in the Hawke’s Bay. The history goes back much further. For a while the town suffered the indignity of the name Hicksville, in memory of the Hicks brothers. But the British Raj came to the rescue. It was a Victorian trend to name places after heroes of the Raj, along with Clive, Havelock and Napier, India’s first governor-general, Warren Hastings was chosen. THE position of Hastings has always been fundamentally important to its growth, and was the determining factor in its founding. Conceived in the mid-1880’s as a commercial centre for the farmers and graziers on the plains, Hastings still numbers servicing the rural community high among its business undertakings. The settlement dates from 1873 when Francis Hicks, purchased a block of Thomas Tanner’s Riverslea estate, found the land too marshy to farm successfully, and cut it into town sections, land being kept for such purposes as a church and a schoolhouse. Hicks retained a site for a store for himself, and offered a one and a half acre site to the Minister of Works for a station and goodsyard. This was an important reason for routing the railway through Hastings in 1874. Flair has been a feature of Hastings’ development since the earliest days. 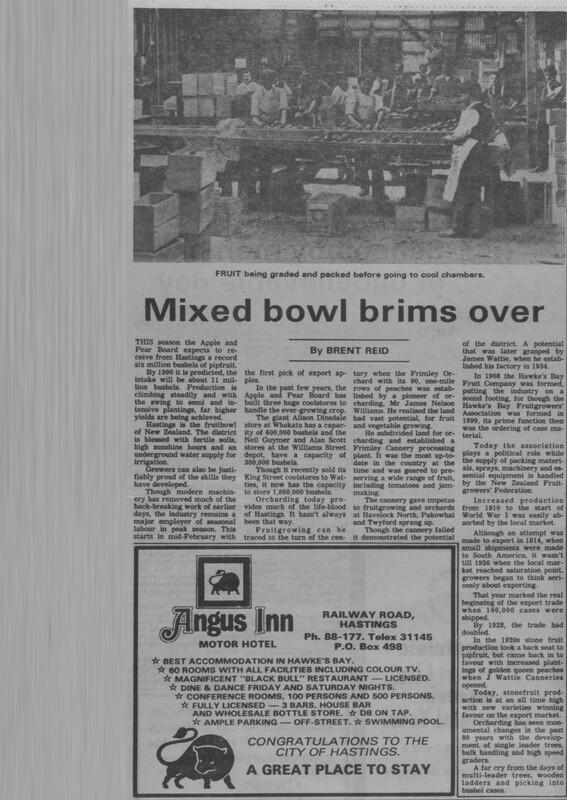 The agricultural servicing industry blossomed into three of the country’s major freezing works, three canneries, including the head office and a processing factory of New Zealand’s largest food combine, and many smaller concerns. The second-stage servicing business has also thrived – engineering workshops, garages and motor dealers, banks and retailers, all the thousand-and-one services required by the rural community. Of course, settlement of the Heretaunga plains goes back far beyond the last 100 years. Much of the land was a river delta, a raupo and flax swamp veined by a network of creeks. Scattered amongst the scrub were pockets of cultivation and several important pa sites belonging to the Ngatikahungunu people. In 1870, however, the Maori owners sold seven European graziers twelve parcels of land which they had been leasing and pakeha settlement of the plains commenced. From these beginnings rose the noble city we have today, Hastings is now much more than just a rural centre. The skilled workforce available in the area has proved attractive to light industry and Hastings is rapidly becoming as well known for this as for more traditional reasons. The centenary is a milestone – a point to take stock. from J.N. ANDERSON & SON LTD. Established in 1889, we have been growing for almost 100 years. Our Quality Houseplants are available from leading plant retailers throughout New Zealand. Our prestigious Plant Hire Service operates in Hawke’s Bay and throughout the Wellington district. J.N. ANDERSON & SON LTD.
HASTINGS orchardist Howard Paynter knows all about the vagaries of fruitgrowing. In the past 60 years, he has seen a lot – storms, droughts, frosts, floods – even earthquakes. But Mr Paynter, who last year was made a life member of the Hawke’s Bay Fruitgrowers’ Association, has never lost faith in the industry. At 79, he is an age when most people have long retired. But he remains actively involved. He operates a 60-hectare block, with his son John, in St George’s Road between Hastings and Havelock North. Fruitgrowing is in the family blood. Paynter’s grandfather grew fruit in Nelson before establishing an orchard in Hastings with his two sons. An office career was planned for Howard Paynter. This changed when he went to Hastings in 1923 to spend the holidays with his uncles. He worked for his uncles for three years and then bought a four-hectare block for a mixed-fruit orchard. He recalls most of the Heretaunga Plains at that time were used for grazing sheep and cattle. The land, ironically, not being considered entirely suitable for fruit. But the advent of the granny smith and golden delicious a well as improved red strains, changed the face of the apple industry. “People began to realise the enormous potential of the area for fruitgrowing,” he said. Though the 1920s produced favourable weather conditions, the 1930s were disastrous. 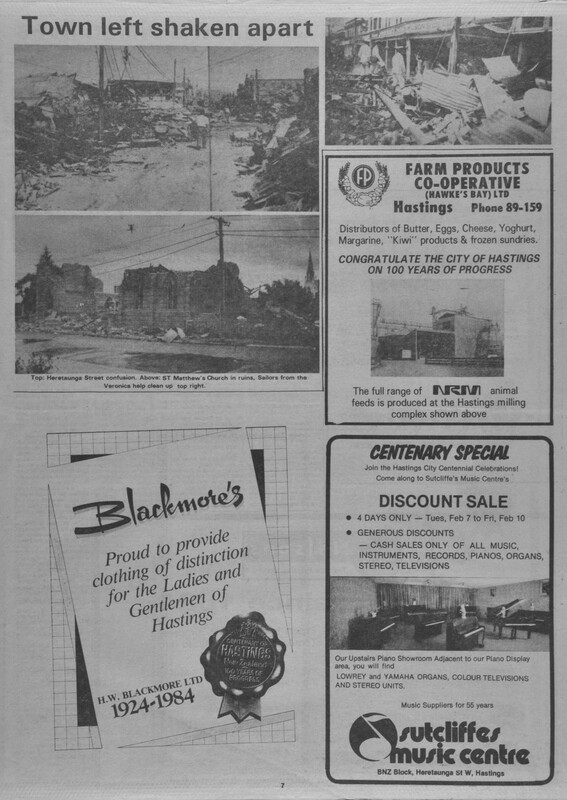 The decade started with the Hawke’s Bay earthquake of 1931 which hit just as the apple season was getting into full swing. The situation was made worse by it being one of the driest years on record with no rain of any consequence till mid-June. Then on the fifth anniversary of the earthquake, a violent storm uprooted trees leaving half the crop on the ground. The following spring a severe frost decimated the crop and before growers could recover, the worst floods in memory in 1938 caused long-term damage to many trees. “It took a darned good grower to survivor and many went to the wall,” says Mr Paynter. Not Mr Paynter though. He diversified by growing asparagus with three associates, Donald Wilson, Harold Carr and Arthur Tonkin. Their property, Asparagus Ltd, in St Georges Road, became the biggest asparagus block in the Southern Hemisphere. High yields were produced, for many years, but by 1960 the block had run its race. Mr Paynter decided to replant it in apples. About 10 years ago the block, the largest apple orchard in New Zealand, was bought by Brierley Investments with Mr Paynter’s son, John, appointed managing director. HOWARD PAYNTER…strong faith in fruit. 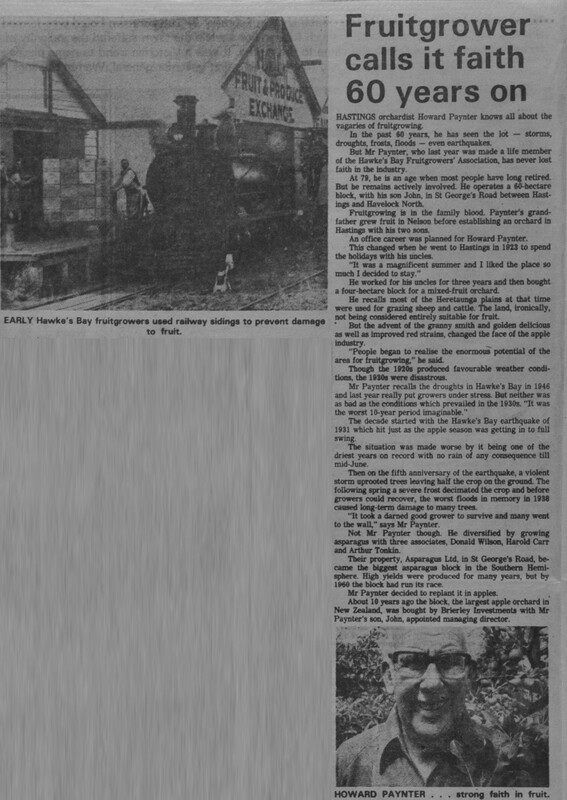 EARLY Hawke’s Bay fruitgrowers used railway sidings to prevent damage to fruit. THIS season the Apple and Pear Board expects to receive from Hastings a record six million bushels of pipfruit. climbing steadily and with the swing to semi and intensive planting, far higher yields are being achieved. Hastings is the fruitbowl of New Zealand. The district is blessed with fertile soils, high sunshine hours and an underground water supply for irrigation. Growers can also be justifiably proud of the skills they have developed. Though modern machinery has removed much of the back-breaking work of earlier days, the industry remains a major employer of seasonal labour in peak season. This starts in mid-February with the first pick of export apples. In the past few years, the Apple and Pear Board has built three huge coolstores to handle the ever-growing crop. The giant Alison Dinsdale store at Whakatu has a capacity of 600,000 bushels and the Neil Guymer and Alan Scott stores at the Williams Street depot, have a capacity of 300,000 bushels. Though it recently sold its King Street coolstores to Watties, it now has the capacity to store 1,860,000 bushels. Orcharding today provides much of the life-blood of Hastings. It hasn’t always been that way. Fruitgrowing can be traced to the turn of the century when the Frimley Orchard with its 90, one-mile rows of peaches was established by a pioneer of orcharding, Mr James Nelson Williams. He realised the land had vast potential, for fruit and vegetable growing. He subdivided land for orcharding and established a Frimley Cannery processing plant. It was the most up-to-date in the country at the time and was geared to preserving a wide range of fruit, including tomatoes and jam-making. The cannery gave impetus to fruitgrowing and orchards at Havelock North, Pakowhai and Twyford sprang up. Though the cannery failed it demonstrated the potential of the district. A potential that was later grasped by James Wattie, when he established his factory in 1934. In 1908 the Hawke’s Bay Fruit Company was formed, putting the industry on a sound footing, for though the Hawke’s Bay Fruitgrowers’ Association was formed in 1899, its prime function then was the ordering of case material. Today the association plays a political role while the supply of packing materials, sprays, machinery and essential equipment is handled by the New Zealand Fruitgrowers’ Federation. Increased production from 1910 to the start of World War I was easily absorbed by the market. Although an attempt was made to in 1914, when small were made to America, it wasn’t till 1926 when the local market reached saturation point, growers began to think seriously about exporting. That year marked the real beginning of the export trade when 100,000 cases were shipped. By 1928, the trade had doubled. In the 1920s stone fruit production took a back seat to pipfruit, but came back in to favour with increased planting of golden queen peaches when J Wattie Canneries opened. Today, stonefruit production is at an all time high with new varieties winning favour on the export market. Orcharding has seen monumental changes in the past 80 years with the development of single leader trees, bulk handling and high speed graders. A far cry from the days of multi-leader trees, wooden ladders and picking into bushel cases. Photo caption – FRUIT being graded and packed before going to cool chambers. BEST ACCOMMODATION IN HAWKE’S BAY. 60 ROOMS WITH ALL FACILITIES INCLUDING COLOUR TV. MAGNIFICENT “BLACK BULL” RESTAURANT – LICENSED. DINE & DANCE FRIDAY AND SATURDAY NIGHTS. CONFERENCE ROOMS, 100 PERSONS AND 500 PERSONS. FULLY LICENSED – 3 BARS, HOUSE BAR AND WHOLESALE BOTTLE STORE. CONGRATULATIONS TO THE CITY OF HASTINGS. ON February 3 1931, New Zealand’s worst modern earthquake struck Hawke’s Bay. Hastings was rattled to ruins 47 years to the day after its founding. Mayor Jim O’Connor remembers the disastrous day well. He was eight years old and playing cricket at St Josephs’ convent during morning break. School had just reopened for the first term after the Christmas holidays. Everything was normal except for a brilliant red glow in the sky – just like a sunset. The day was hot, uncomfortably so but it was good cricket weather and O’Connor was fielding at long leg close to the Heretaunga Street side of the ground. Then without warning, all hell broke loose. Jim O’Connor remembers the quake as though it happened yesterday. At first he didn’t know what had happened. “I had never experienced an earthquake before.” The initial shock was so forceful that children in the playground were flung about like chaff in the wind. Cracks opened in the ground. The brick chimney at the school toppled. Miraculously no one was seriously injured. He remembers the first shock lasting 20 to 30 seconds. He managed to regain his feet after two or three minutes, and walked out on to Heretaunga Street. He knew the street well as it was on the way to school from his home in Heathcote Street at Raureka on the other side of the town. The first thing he noticed was that the Monarch Motors building in the next block had been flattened. “I couldn’t believe it, the garage had just opened that day. My father had helped build it,” he said. The pupils at the school were told to wait in the grounds till they were picked up. As they rode through scenes of devastation, Mr O’Connor thought to himself – this must be the end of the world. When they arrived home, several neighbours stood on the roadside, too nervous to enter their homes. A billy was boiled and everyone had a cup of tea. Mr O’Connor’s father, who had helped rescue the trapped people, insisted that the family should sleep inside. As they reached the verandah the second major shake, almost as violent as the first, struck the town. “I remember looking at the front of the house and the next thing the western wall appeared in front of me. The tremors continued for days. Clearing the ruins was a monumental task. Much of the rubble was dumped in a huge pit which now forms St Leonard’s park next to the stockyards at Stortford Lodge. There was a mass exodus out of Hastings as families went to live with relatives till order was restored. There was also a large influx of tradesmen looking to rebuild the town. “In the middle of the great depression Hawke’s Bay became the only place where work was available,” he said. 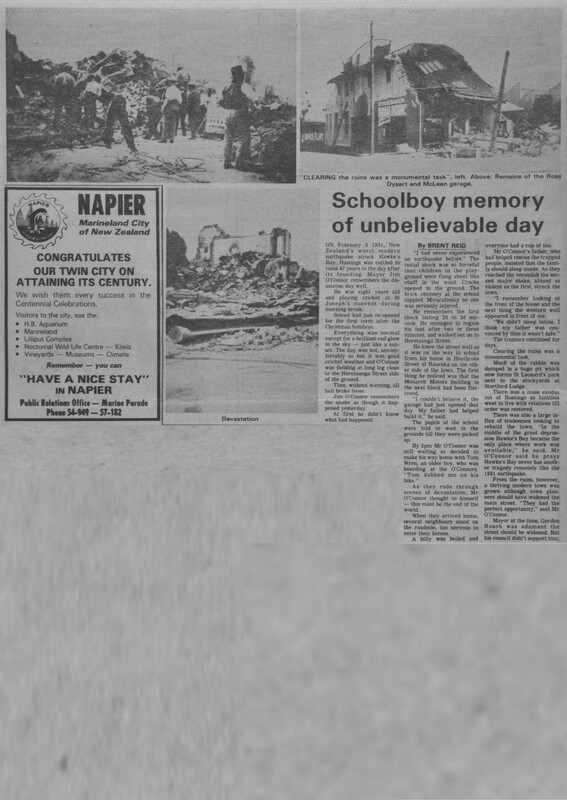 Mr O’Connor said he prays Hawke’s Bay never has another tragedy remotely like the 1931 earthquake. From the ruins, however, a thriving modern town was grown although town planners should have widened the main street. “They had the perfect opportunity,” said Mr O’Connor. Mayor at the time, Gordon Roach was adamant the street should be widened. But his council didn’t support him. “CLEARING the ruins was a monumental task”, left. Above: Remains of the Ross Dysart and McLean garage. OUR TWIN CITY ON ATTAINING ITS CENTURY. We wish them every success in the Centennial Celebrations. Top: Heretaunga Street confusion. Above: ST Mathew’s Church in ruins, Sailors from the Veronica help clean up top right. Distributors of Butter, Eggs, Cheese, Yoghurt, Margarine, “Kiwi” products & frozen sundries. Join the Hastings City Centennial Celebrations! In this, the centenary year of Hastings, residents of the city and surrounding areas might spare some thought for a man whose contribution to Hastings has never been equalled, writes BRENT REID. THE late Sir James Wattie, founder of J Wattie Canneries in 1934, built an enterprise which has contributed enormously to the prosperity of the district by providing a vast outlet for the wide range of crops produced on the rich, alluvial Heretaunga plains. There would be few people in the district who at some time have not had some connection with Watties, be it directly or indirectly. Though Sir James is no longer here, the factory which he built in the middle of Hastings remains as a monument to his immense contribution. Sir James never let success go to his head. Kings or paupers, he treated them all the same. It was this empathy with the small man that endeared Sir James to all who came in contact with him. Never was this better illustrated than in February 1962 when a disastrous fire destroyed a major part of the factory. Not only did staff perform well beyond the call of duty but it seemed the whole of Hastings was prepared to do their bit to get the plant back in production. Sir James, sleeves rolled up, was right in the thick of it all, calmly telephoning for new equipment to get the factory back in business. Miraculously, the plant was back in production within 48 hours of the fire. It took a man with the foresight, the initiative, the courage of Jim Wattie in 1934, to put his money where his mouth was. The rise of Jim Wattie was without doubt a rags to riches story. He first came to Hastings when his family moved from the South Island in 1915. His first job was delivering telegrams. Later he worked as a junior clerk with the Hawke’s Bay Farmer’s Meat Company and by 1924 had become secretary of the Hawke’s Bay Fruitgrowers’ Ltd.
His first break came in 1934 when Whittome Stevenson and company contemplated importing jam pulp from Tasmania. Jim Wattie, then 32, immediately saw this was a chance for Hawke’s Bay orchardists. Mr. Harold Carr who was a director of Watties until his retirement recently, was a young accountant in Hastings at the time and produced the information which led to the turning point in Jim Wattie’s life. This is how Sir James later told the story. “I think I can say in truth at that moment I realised here was my chance to do something for myself and for Hastings. “I got my employers to let me take the train to Auckland immediately. At the Whittome Stevenson plant in Newmarket, I called on Colonel Stevenson, a fine old gentleman, who confirmed Harold Carr’s story. “Colonel Stevenson agreed that if we could match the Tasmanians in quality, price and assurance of deliveries he’d be happy to give us the business. “There was nothing very odd about their wanting to import pulp. New Zealand then was importing most of its canned fruit and vegetables – the vegetables mainly from England: the fruit from California and Australia. “Back in Hastings, everybody concerned thought it was great, our producing pulp instead of the Tasmanians. But the company didn’t have the money to buy plant for pulping and get into business. “I asked if they minded my forming a syndicate with Harold Carr and trying to build a plant. My employers said: ‘Go ahead’. 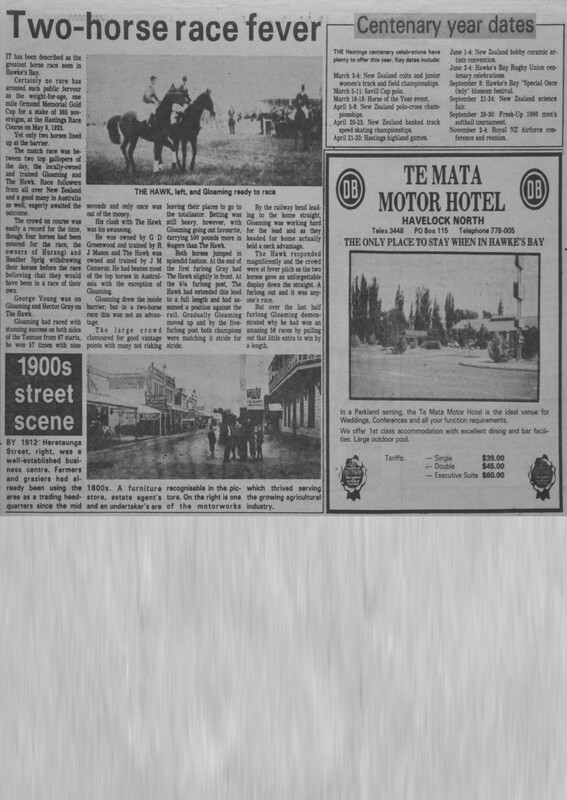 “Harold and I went down Heretaunga St, our main street, and called on businessmen. We asked them to put 25 or 50 pounds into what we called bonds, but we said to regard it as help-the-district charity rather than an investment. “In two days we collected 1250 pounds. To this day I can recollect the order in which we did things and got moving. “My employers had on their property a house which was let to a tenant who was having difficulty in finding the rent. We got that as our first factory. “We got a secondhand steam boiler from an abattoir. They fortunately took payment in bonds. “We spent 300 pounds on two steam-jacketed pans from, I remember the makers, Stewart and Longbottom, of Auckland. “Buying a gooseberry snipper for topping, and tailing gooseberries, from America cost us about 100 pounds. We paid Whittome Stevensons about 70 pounds for a second-hand old pulper – to sieve stone fruits and separate flesh from stones. “We bought from Gadsens, tins in which to pack our pulp. We spent about 200 pounds on odds and ends, and that left 400 or 500 pounds working capital. “As we were, in effect, a charity, we – J Wattie Canneries Ltd – registered under the Industrial and Provident Societies Act, and hence escaped tax. But when, after a year, we sought more capital we had to register under the Companies Act. “In our first year we took over our landlord company. In addition to sending pulp to the jam factory in Auckland, we canned peaches and pears. They sold well. Sir James’ first factory was a wooden building which stood on the present factory site. From those beginnings Watties is now the country’s undisputed leader in food production, the Watties label being synonymous with canned and frozen food products. This year Watties celebrates its 50th anniversary. The only pity is that Sir James is not here this week to see it all. But time will not diminish his memory. Men of the calibre of Sir James Wattie are few and far between. His recipe for success simple. “There is only one place success comes before work and that is in the dictionary,” was his favourite quotation. Photo caption – THE first Wattie factory in Hastings. 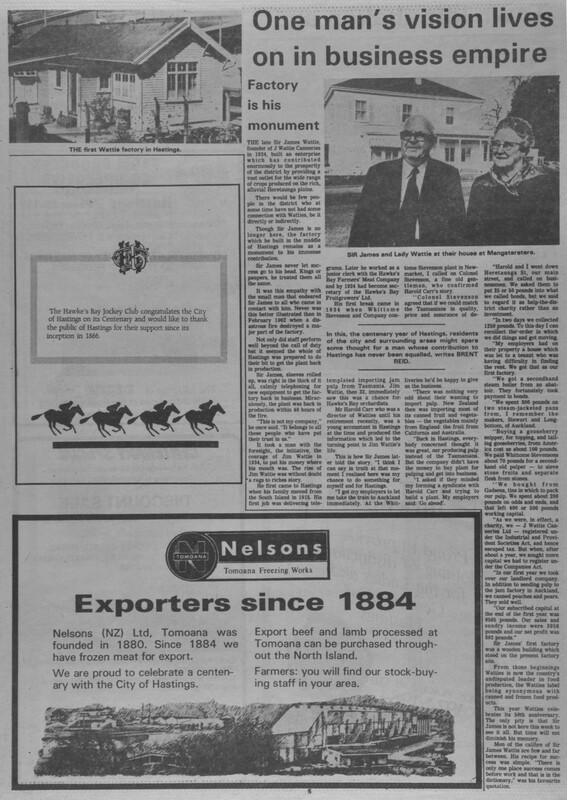 Nelsons (NZ) Ltd, Tomoana was founded in 1880. Since 1884 we have frozen meat for export. We are proud to celebrate a centenary with the City of Hastings. Export beef and Iamb processed at Tomoana can be purchased throughout the North Island. Farmers: you will find our stock-buying staff in your area. LAST year the Tomoana Freezing Works set a record mutton kill in its new multi-million dollar complex. William Nelson, its founder, started the Nelson Brothers Freezing Works at Tomoana in Hastings in 1880. A man of diverse talents, his greatest contribution to the prosperity of the district was the freezing works. He was also responsible for the establishment of the Tyser Shipping Line which provided the extra cargo ships needed for the export trade in frozen mutton which began in 1882 when the steamer Dunedin started its historic voyage. Nr Nelson also took an active interest in the drainage of the Heretaunga plains which provide Hastings with much of its wealth. Education also interested him. He founded the boy’s school now known as Hereworth at Hastings and was one of the original promoters of Woodford House at Havelock North. Born in England, Mr Nelson came to New Zealand while still a young man. During his early working life in England, he gained valuable experience in industry – knowledge he was to put to practical use in Hawke’s Bay. He had a natural talent for organisation and the courage and determination to achieve his goals and a keen eye for opportunities that were overlooked by others. William Nelson died at his residence at Waikoko House, in 1932. 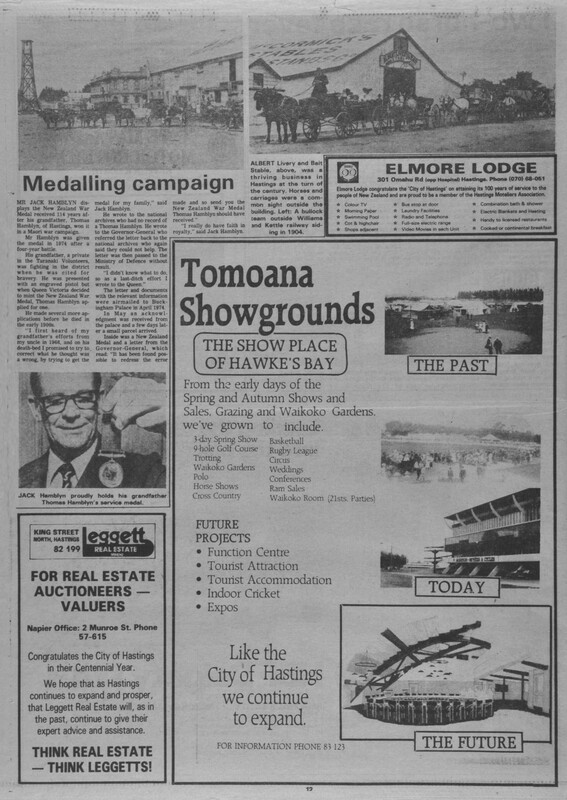 The homestead, burnt to the ground in 1976, was part of the Tomoana Showgrounds. EARLY DAYS at the Tomoana works – pullers at work in the fellmongery. Manufacturers of SEAGRO and NATURMEX CONCENTRATE. We congratulate the City of Hastings on their Centenary. We are proud to be part of the community and wish them every success in their Centennial Year. 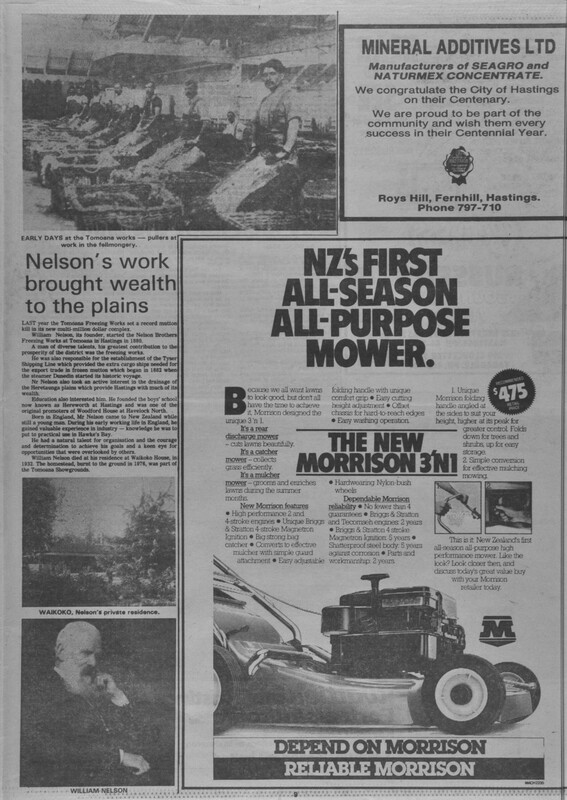 NZ’S FIRST ALL-SEASON ALL PURPOSE MOWER. Because we all want lawns to look good, but don’t all have the time to achiever it, Morrison designed the unique 3 ‘n 1. It’s a rear discharge mower – cuts lawns beautifully. It’s a catcher mower – collects grass efficiently. It’s a mulcher mower – grooms and enriches lawns during the summer months. 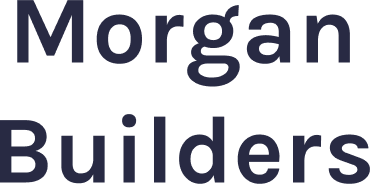 Dependable Morrison reliability – No fewer than 4 guarantees – Briggs & Stratton and Tecomseh engines: 2 years – Briggs & Stratton 4 stroke Magnetron Ignition: 5 years – Shatterproof steel body: 5 years against corrosion – Part and workmanship: 2 years. 1. Unique Morrison folding handle angled at the sides to suit your height, higher at its peak for greater control. Folds down for trees and shrubs, up for easy storage. 2. Simple conversion for effective mulching mowing. This is it: New Zealand’s first all-season all-purpose high performance mower. Like the look? Look closer then, and discuss today’s great value buy with your Morrison retailer today. MAURICE BROWNLIE, who some believe was the greatest of all New Zealand forwards, played for the Hastings Club from1921 to 1930. Brownlie, a loose forward was a man of herculean strength. He played 61 times for the All Blacks and captained Hawke’s Bay in several Ranfurly Shield defences in the 20s. Selector Norman McKenzie who brought Brownlie into prominence said of him in his book On With The Game, “Maurice is the greatest man I’ve ever seen as a side row forward because he was great in every respect of forward play. For sheer tenacity I have seen nothing to equal him. Brownlie played his last first-class match for Hawke’s Bay against the British Isles at Napier in 1930. Maurice Brownlie died at Gisborne in 1957, aged 59. HASTINGS could be remembered as the graveyard of Hawke’s Bay rugby were it not for an incredible slice of good fortune on September 2, 1922. Three weeks earlier an unsung Bay side had lifted the province from the pit of mediocrity by unexpectedly lifting the Ranfurly Shield from Wellington by 19 points to 9. “We gave Wellington a real shock, they hadn’t taken us seriously,” says Jackie Blake, who scored one of the Bay’s four tries that day. Mr Blake, who lives in Hastings, was also a member of the team which defended the Shield in the Bay’s first defence against Bay of Plenty at Hastings that September 2. Also playing in that challenge were Gordon Yates, Bert Greenside (the highest try-scorer in shield history), and Wattie Barclay, of “battle of Solway” fame, who are still alive today. Though the Bay’s great forward Maurice Brownlie was in Australia with the all Blacks when the Bay lifted the shield, he was back for the Bay of Plenty match. But the Bay’s celebrated selector, Norman McKenzie, decided to retain the same side and left Brownlie on the side line. How he must have rued his decision as the Bay struggled to keep its nose in front! With two minutes remaining the Bay held a 17-13 lead but then Bay of Plenty scored a try close to the posts to make the score 17-16. The conversion was a formality. Bay of plenty, it seemed, would end the Bay’s tenure before it had started. The captain, McLean came up to take the kick, but for some reason changed his mind and gave the ball to Boucher, the halfback. Trembling with nerves, he lined up the kick. 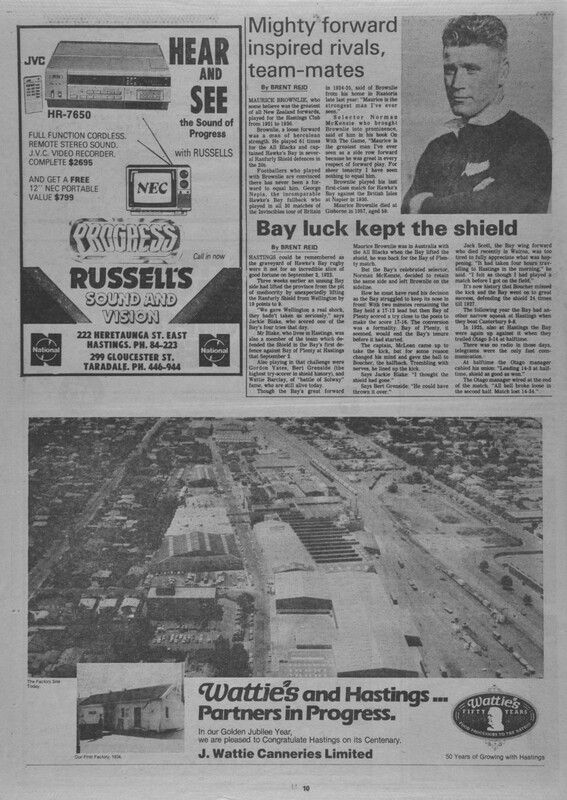 It is now history that Boucher missed the kick and the Bay went on to great success, defending the shield 24 times till 1926. The following year the Bay had another narrow squeak at Hastings when they beat Canterbury 9-8. In 1925, also at Hastings the Bay were again up against it when they trailed Otago 3-14 at halftime. 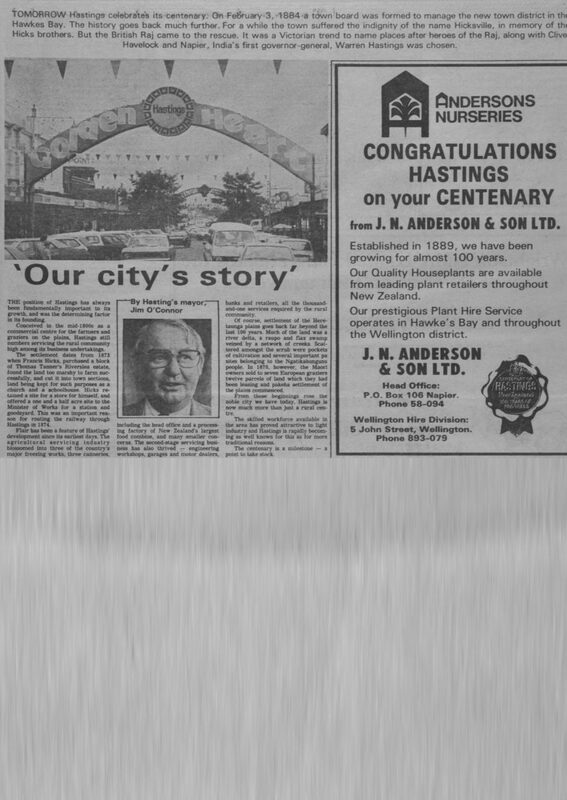 In our Golden Jubilee Year, we are pleased to Congratulate Hastings on its Centenary. IT has been described as the greatest horse race seen in Hawke’s Bay. Certainly no race has aroused such public fervour as the weight-for age, one mile Ormond Memorial Gold Cup for a stake of 365 sovereigns, at the Hastings Race Course on May 9, 1925. Yet only two horses lined up at the barrier. The match race was between two top gallopers of the day, the locally-owned and trained Gloaming and The Hawk. Race followers from all over New Zealand and a good many in Australia as well, eagerly awaited the outcome. The crowd on course was easily a record for the time, though four horses had been entered for the race, the owners of Hurangi and Heather Sprig withdrawing their horses before the race believing that they would have been in a race of their own. George Young was on Gloaming and Hector Gray on The Hawk. Gloaming had raced with stunning success on both sides of the Tasman from 67 starts, he won 57 times with nine seconds and only once was out of the money. His clash with the Hawk was his swansong. He was owned by G D Greenwood and trained by R J Mason and The Hawk was owned and trained by J M Cameron. He had beaten most of the top horses in Australasia with the exception of Gloaming. Gloaming drew the inside barrier, but in a two-horse race this was not a advantage. The large crowd clamoured for good vantage points with many not risking leaving their places to go to the totalizator. Betting was still heavy, however, with Gloaming going out favourite, carrying 5000 pounds more in wagers than The Hawk. Both horses jumped in splendid fashion. At the end of the first furlong Gray had The Hawk slightly in front. At the 6½ furlong post, The Hawk had extended this lead to a full length and had assumed a position against the rail. Gradually Gloaming moved up and by the five furlong post both champions were matching it stride for stride. By the railway bend leading to the home straight, Gloaming was working hard for the lead and as they headed for home actually held a neck advantage. The Hawk responded magnificently and the crowd were at fever pitch as the two horses gave an unforgettable display down the straight. A furlong out and it was anybody’s race. But over the last half furlong Gloaming demonstrated why he had won an amazing 56 races by pulling out that little extra to win by a length. March 3-4: New Zealand colts and junior women’s track and field championships. March 5-11: Savill [Savile] Cup polo. March 16-18: Horse of the Year event. April 5-8: New Zealand polo-cross championships. April 20-23: New Zealand banked track speed skating championship. April 21-23: Hastings highland games. June 1-4: New Zealand hobby ceramic artists convention. June 2-4: Hawke’s Bay Rugby Union centenary celebrations. September 8: Hawke’s Bay “Special Once Only” blossom festival. September 21-24: New Zealand science fair. September 29-30: Fresh-Up 1000 men’s softball tournament. November 2-4: Royal NZ Airforce conference and reunion. BY 1912 Heretaunga Street, right, was a well-established business centre. Farmers and graziers had already been using the area as a trading headquarters since the mid 1800s. A furniture store, estate agent’s and an undertaker’s are recognisable in the picture. On the right is one of the motorworks which thrived serving the growing agricultural industry. In a Parkland setting, the Te Mata Motor Hotel is the ideal venue for Weddings, Conferences and all your function requirements. We offer 1st class accommodation with excellent dining and bar facilities. Large outdoor pool. MR JACK HAMBLYN displays the New Zealand War Medal received 114 years after his grandfather, Thomas Hamblyn, of Hastings, won it in a Maori war campaign. Mr Hamblyn was given the medal in 1974 after a four year battle. His grandfather, a private in the Taranaki Volunteers, was fighting in the district when he was cited for bravery. He was presented with an engraved pistol but when Queen Victoria decided to mint the New Zealand War Medal, Thomas Hamblyn applied for one. He made several more applications before he died in the early 1900s. “I first heard of my grandfather’s efforts from my uncle in 1968, and on his death-bed I promised to try to correct what he thought was a wrong, by trying to get the medal for my family,” said Jack Hamblyn. He wrote to the national archives who had no record of a Thomas Hamblyn. He wrote to the Governor-General who referred the letter back to the national archives who again said they could not help. The letter was then passed to the Ministry of Defence without result. The letter and documents with the relevant information were airmailed to Buckingham Palace in April 1974. In May an acknowledgement was received from the palace and a few days later a small parcel arrived. “I really do have faith in royalty,” said Jack Hamblyn. Jack Hamblyn proudly holds his grandfather Thomas Hamblyn’s service medal. ALBERT Livery and Bait Stable, above, was a thriving business in Hastings at the turn of the century. Horses and carriages were a common sight outside the building. Left: A bullock team outside Williams and Kettle railway siding in 1904. Elmore Lodge congratulate the ‘City of Hastings’ on attaining its 100 years of service to the people of New Zealand and are proud to be a member of the Hastings Moteliers Association. From the early days of the Spring and Autumn Shows and Sales, Grazing and Waikoko Gardens, we’ve grown to include. Congratulates the City of Hastings in their Centennial Year. We hope that as Hastings continues to expand and prosper, that Leggett Real Estate will, as in the past, continue to give their expert advice and assistance. THINK REAL ESTATE – THINK LEGGETTS!